The Index opened strong around 8527 and went on to touch the highs of the day around 8550, but a smart sell-off saw the index dip below by 100 points only to close flat at 8491.00, small loss of 1.30 points. The broader market though was positive, with 868 advances to 617 declines. Developing Range as per Option Table comes 8300-9000. Call option 8700-9100 added huge 8.65 lacs OI with small short covering seen at 8600 strike price. 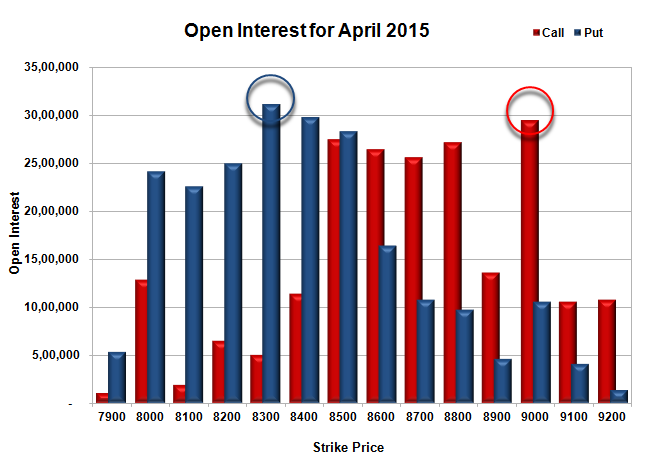 Put option 8600-8300 added huge 7.56 lacs OI with small short covering seen at 8700 and above strike prices. Nifty Open Interest is at 1,95,16,750 down by 6,06,400, with decrease in price, most probably huge long liquidation. 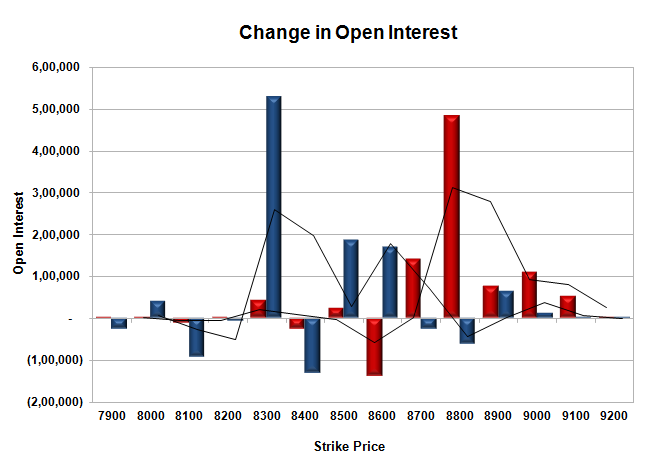 Bank Nifty Open Interest is at 20,90,100 up by 76,800, with decrease in price, most probably huge short build-up. FII’s bought 5.22 lacs Futures, which includes 21577 contracts long build-up and 682 contracts short build-up, with increase in net OI by 22259 contracts (includes 64177 longs to 43282 shorts for the day) and the Average Price comes to 8661.94. FII’s Index future open contract as on date is 511549 Longs to 130142 Shorts, net long 381407 up by 20895 contracts. Initial support at 8400, with OI of 29.81 lacs and below that at 8300 with highest OI of 31.10 lacs. Initial resistance at 8600, with OI of 26.50 lacs and above that at 9000 with OI of 29.51 lacs. 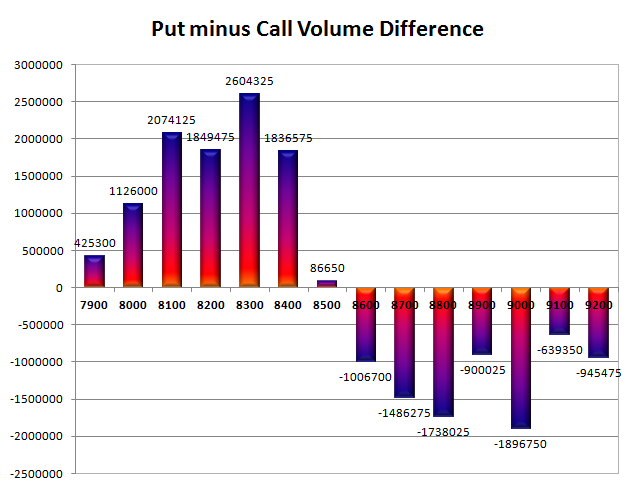 Day Range as per Option Table is 8411 - 8585 and as per VIX is 8427 - 8555 with 8499 as the Pivot.